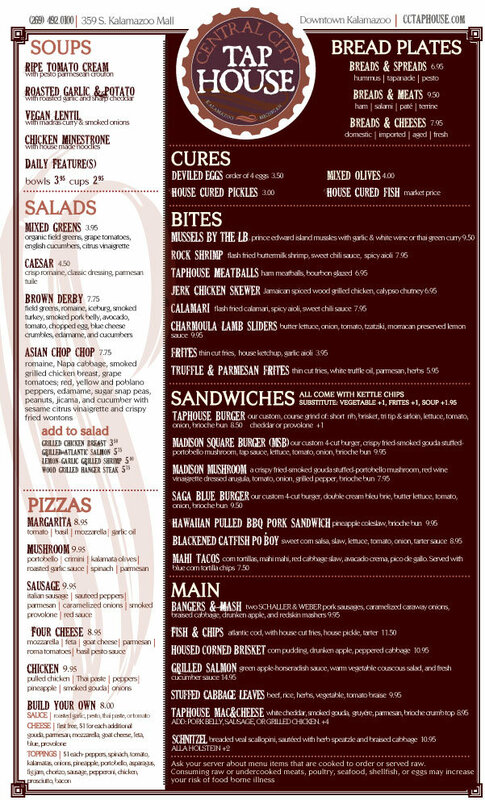 One of the things I’ve learned since I started writing this blog (and it’s predecessor in Lansing) is that opening weeks are usually bad times to go to new restaurants. The last thing I want is for an experience to a place I’ve been hyping up be ruined because staff is still working out the kinks. That said, I went against that thinking tonight when J and I decided to try out the Millennium Restaurant Group’s newest restaurant, Central City Tap House. We were intrigued last week at the Taste of Kalamazoo when we tried stop by the Tap House’s booth and picked up some Truffle Frites. They were delicious. We picked up a coupon for 20% off, but it isn’t good until August. Still, we really wanted to check this place out. 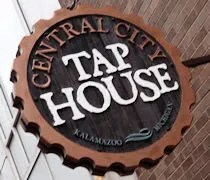 The Central City Tap House is on the Kalamazoo Mall in the Epic Center. It’s connected to Epic Bistro and separated from the main dining room of that restaurant by a newly constructed wall. 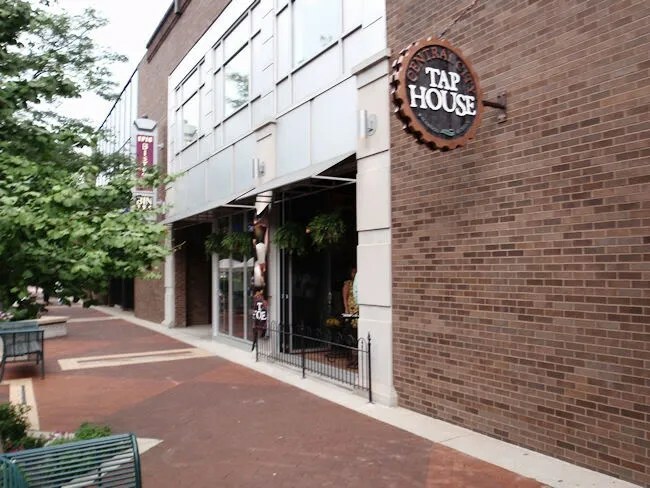 The Tap House is fairly small with room for only 80 people. The walls are decorated with black and white photos of area landmarks, but the bar and 20 taps are the centerpiece of the space. The tables are packed into the small space and on opening night, most were full, but there was still an open table for J and I. The table we picked is a high two top between the bar and booth seating. As soon as we sat down, a waiter came over with a beer glass full of pretzels to snack on while we waited for our food. He started going over the beer list then realized he hadn’t brought the menus over. He ran back to pick up both the beer menu and the food menus. The beer menu looks like it’s actually a business card holder. It’s filled with about 90 different types of beer. Twenty of those are on tap, seventy are in bottles. There is one brew that will rotating each month that is pulled right from the cask. J and I both went with beers since we were at a pub that is focusing on handcrafted brews. I stayed local and got Bell’s Two-Hearted Ale. J had Hennepin Famhouse Saison from Ommegang Brewer which was a suggestion from our waiter She really liked her beer and said it could become one of her new favorites. 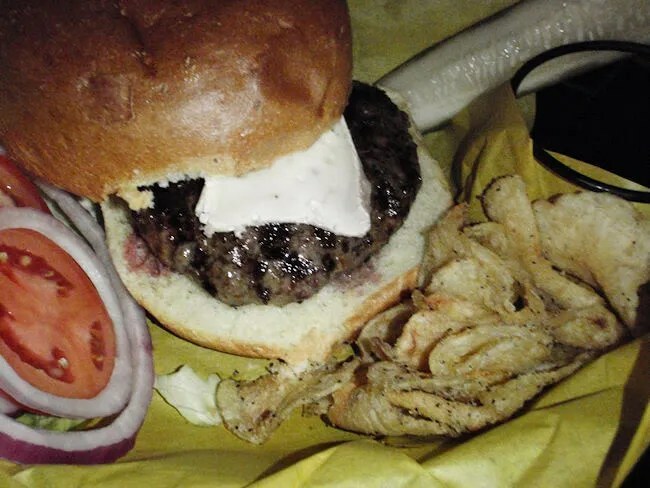 While the beer is the star at Central City Tap House, the menu is what you would expect from a Millennium restaurant. It’s not huge, but it’s filled with a lot of upscale pub food. There are three burgers on the menu and all are right up my alley. I went with the Saga Blue Burger. The meat is a custom grind of short rib, brisket, tri-tip and sirloin. It’s served on a brioche roll with a thick slice of double cream blue brie. The burger was cooked perfectly without my asking. It was juicy and had just a hint of pink running through the middle. The bun was perfect. I thought at first there may be a little too much bread, but the soft yet somehow still crusty roll held everything together. The cheese was the big surprise for me. I had never heard of Blue Brie which, as the name implies, is a combo of bleu cheese and brie. I was very surprised by the big slab of it on top of the meat and again surprised when it melted perfectly after I put the top bun on. My sandwich came with Kettle Chips. I could have upgraded to the frites, but decided to stick with the chips. If there was any complaint with my meal it was the scant amount of sides. There wasn’t even a handful of chips in the basket with my burger. What was there was very delicious. They were thin and crispy with I believe is a french onion seasoning. J was leaning towards the Tap House Mac & Cheese which features white cheddar, smoked gouda, and Parmesan, but really wanted fries, so instead, she ordered the Hawaiian Pulled BBQ Pork Sandwich. 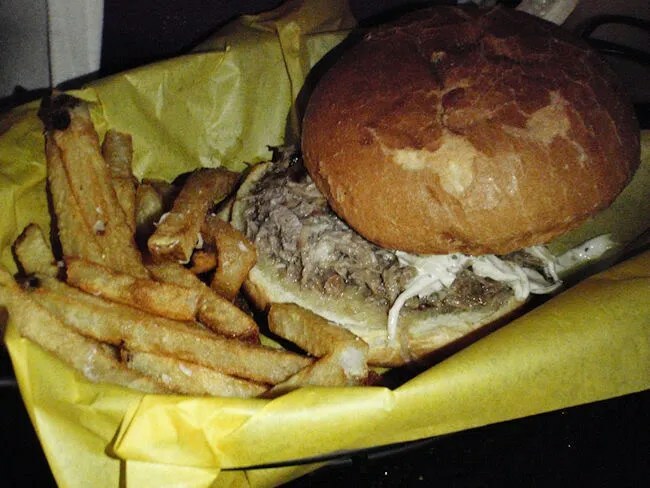 This sandwich also has the brioche bun and it’s filled with BBQ pork and a pineapple coleslaw. Something that would have pissed me off is that the pork is made with onions. It’s not on the menu, but the waiter did bring it up and made sure J was ok with. She asked if there was anyway to leave them off, but the onions are cooked along with the meat. It’s not an add-on. She said she was ok with and never mentioned the onions after she bit into the sandwich. Our waiter did mention that was his favorite sandwich on the menu and J had no reason to disagree with him. She said the meat was very tender and the pineapple slaw was delicious. Unlike me, she did upgrade to the Frites and even went a step further ordering the Truffle Frites which are an extra $2.50 instead of an extra buck. The fries are what really turned us on to the Central City Tap House and they didn’t disappoint. We were given a dessert menu which resembled a bookmark. There are only two options. Beignets or a Chocolate Stout Rootbeer Float. We considered the beignets but didn’t have the time. I got a couple phone calls during dinner and had to meet someone from work to pick some stuff up, so we passed and decided we’d try them next time. Our bill was a little over $30. That’s not cheap, but it did include two $4 beers. J’s sandwich, with the upgrade to the fries was almost $13. My was right at $10. The food is quality, but I would have liked a few more chips. Even J’s basket looked a little light on the fries. Other than that, our experience at Central City Tap House was better than I would expect. There were no opening night problems. Our server was great and very helpful when picking beer. The atmosphere is great. Our food came out pretty quickly. Even if you’re not looking to eat, it’s a beer lover’s dream and the staff was expecting a busy night later once the dinner crowd cleared and the drinking crowd moved in. We will definitely be back. We’ve always had great experience at a Millennium restaurants and this new venture is no different. If you haven’t yet, check out their woodfired pizzas which they started doing in January. Build your own personal for $7.95 during the day, or get half off a large after 9. I do pepperoni, ham, and pork belly along with several cheeses. And yes, these combine with the 30% Monday discounts. Nice! No, we haven’t been there since Kalamazoo Beer Week last winter and that was just for a couple of drinks. Will need to check that out. Thanks!